Your skin requires nourishment from foods to maintain health; if you are deficient in certain vitamins, finding the proper supplements may restore your skin to a healthy youthfulness. Supplements may prevent acne flare-ups by improving your immune system and protecting it from environmental pollutants. Certain vitamin, mineral and essential fatty acid supplements may relieve your skin of excess oil, blackheads and the appearance of large pores. Never take supplements in excess or use them as a substitute for healthy foods; check with your physician to make sure supplements will not interact with prescribed medication and are not contraindicated for your health condition. Your pores produce oil, which is necessary for healthy skin. However, if your pores become clogged with an overproduction of sebum and dead skin cells, blackheads will develop, giving your pores an enlarged appearance. Vitamin A is essential for maintaining, repairing and strengthening your skin’s protective tissue. Vitamin A acts as an antioxidant that rids your body of toxins and helps to reduce sebum production. 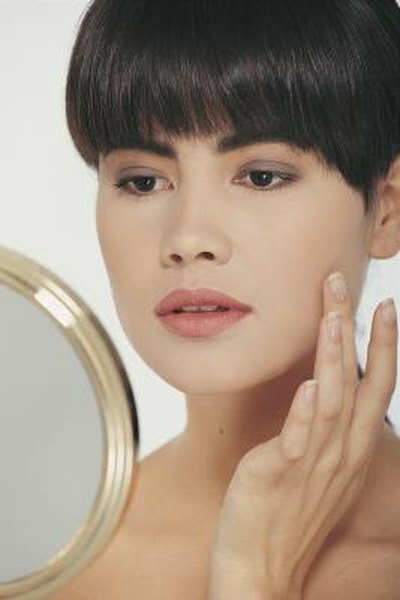 A vitamin A deficiency may cause skin problems.Retinoid is a derivative of vitamin A that works to treat acne topically or orally, as recommended by your dermatologist. The daily recommended dose for adult women is 700 mcg per day, for adult men 900 mcg per day. Consuming too much vitamin A may be toxic. Acne breakouts can occur if your diet is deficient in zinc. Zinc supplements have anti-inflammatory and antibacterial properties necessary for oil-producing glands. Zinc may reduce acne, large pores and blackheads associated with oily skin. Adults can take up to 40 mg of zinc a day; don't take more than that. Zinc may interact with tetracycline, a drug often prescribed to treat acne, so consult with your doctor prior to taking zinc if you are on this drug, or any medication. Vitamin C acts as an antioxidant to protect your skin from free radicals. Free radicals are the compounds created when your body converts food into energy is exposed to environmental pollutants such as cigarette smoke, air pollution and ultraviolet sunlight. Vitamin C also creates collagen, which repairs skin and protects your immune system. The daily recommended dose for adult women is 75 mg per day, for adult men 90 mg per day. If you are deficient in omega 3 fatty acids, your skin may suffer. Blackheads develop when oil and dead skin block pores. Omega 3 fatty acids play a vital role in achieving healthy skin by controlling flaky skin and helping to maintain elasticity. An omega 3 supplement high in docosahexaenoic acid (DHA) and eicosapentaenoic acid (EPA) is derived from cold water fish such as salmon, trout, sardines and mackerel. The daily recommended dose for adults is 600 to 1,000 mg daily.